Prices shown are per unit, excluding VAT and delivery. Please contact us for volume and reseller pricing. The ARC-C is a highly secure and flexible RFID smartcard reader with a colour touchscreen, belonging to STid's Architect range of modular wall-mounted door access readers. 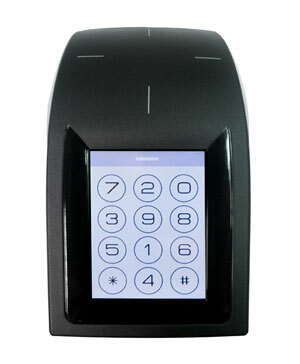 The ARC-C provides one or two-factor identification at the door (card and/or PIN) and various operating modes, enabling an on-screen pin-pad or scramble-pad to be displayed, as well as various additional display and messaging functions. The reader supports a wide range of secure encoding formats on various different card technologies, including MIFARE Classic and DESFire EV1 and EV2. It is also capable of reading card serial numbers, enabling convenient migration from legacy systems. Designed to work with most standard door access systems, the Architect ARC-C is connected and powered via a standard Wiegand or clock and data interface, and comes complete with a wall mount that is also compatible with European back boxes. Other interface versions are also available � please contact us for details. Rated to IP65 and capable of operating in a wide range of environments, the reader is housed in a strong, vandal-proof design and includes an innovative accelerometer-based tamper detection system and a full-colour RGB LED for status indication and user feedback. The ARC-C reader is normally supplied pre-configured to requirements. Customers can also purchase the optional SECard programming kit, which enables on-site configuration of all STid readers as well as management of encryption keys and encoding of user cards. Please note that we are closed for the Easter Holidays from Friday 19th April until Tuesday 23rd April. You can still place an order online during this time, but it will not be shipped until after we return (your card will not be charged until despatch). We wish a HAPPY EASTER to all our customers. If you are based in the USA, Canada or Mexico we would be delighted to serve you directly from our US office. Visit Smartcard Focus USA for local pricing, delivery and support. © 2019 Dot Origin Ltd.